"It was difficult for me, really. When I [say] difficult, difficult," the former undocumented migrant tells the BBC in a phone interview. But fast-forward half a year and John is a legal resident in Italy and hailed a "migrant hero" for confronting an armed robber. He feels like the luckiest man on earth now that he has literally been blessed by the Pope himself. As part of Saturday's Easter service at the Vatican, the 31-year-old bent before Pope Francis to be baptised alongside seven other adults from around the world. 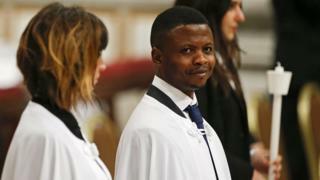 Already a Catholic, but never baptised in his home state of Kaduna in north-west Nigeria, John says the experience was a "great surprise" to him and the happiest in his life. "To be baptised by the Pope, it means a great future, a great blessing," said John, who took the baptismal name of Francesco in honour of the Pope. "I was nobody before, but now I become somebody," he shared. But how did this somebody get here? Four years ago, John left Nigeria to escape a criminal gang that wanted to recruit him, according to Italian media. After a short stay in Libya, the welder by trade made his way to Italy on a smuggler's boat. On his arrival, he filed for asylum but in 2016 his case was rejected and he decided to stay on as an undocumented migrant. In September last year, the 31-year-old was begging for money outside the Carrefour supermarket in Rome's Centocelle neighbourhood, much as he had done for months. What happened next would change his life. A masked thief armed with a meat cleaver tried to make off with €400 (£349) he had stolen from the supermarket's cashiers. But John, who was watching the robbery unfold, refused to stand by and let the 37-year-old Italian escape. "I wouldn't have cared if he had killed me that day, what he did was not good." John explained to the BBC. "The bible says thou shalt not steal. Yes, thou shalt not steal." Security cameras captured his next heroic steps - confronting the armed robber with nothing but his bare hands, wrestling the cleaver away and after the thief fell from his getaway scooter, holding him by the collar until the police arrived. John suffered some minor cuts in the scuffle and said he was afraid, but "God protected me". Once the local police arrived to arrest the Italian, he became conscious of his lack of legal documentation and disappeared. But Rome's police authorities sought to reward his courage, and after John came forward again weeks later, they helped him secure a coveted Italian residency permit. "I don't want to be a hero. I just want to be legal, work and have a dignified life in Italy," he had told Italian media at the time. After appearing on national television, he told the BBC he was offered three jobs. According to Italian news agency ANSA, he now works for the Italian Red Cross as a warehouse stockman, finally able to provide for his child back in Nigeria. The policeman from the supermarket's neighbourhood then encouraged the 31-year-old to share his story with the Pope. Pope Francis has repeatedly highlighted the plight of migrants during his papacy, and John said in his letter: "I want you to baptise me if it is possible." With the local police captain as his godfather, John received his wish on Saturday in front of 10,000 worshipers during one of the holiest nights in the Catholic calendar. "I feel so happy right now," John told the BBC, explaining the glory he felt was given to him by God. "The Pope laid his hand on me… and believed I am somebody." During the service, Pope Francis had asked worshippers what they could do to help others. "This Easter of 2018, what will I do? What will you do?" John Francesco Ogah, who was listening, said the answer was clear to him: he would do what he did again without hesitation.